Dayum looks really clean. She's got good taste! Welcome aboard I'm curious to hear your thoughts/opinions on how the 2 bikes compare. Unfortunately I have come to the conclusion that the 1998 Superhawk is better all around thatn the 2007 SV1000. It feels lighter with better brakes and suspension. Not sure its really faster. The SV has better wind protection so there is that. Kinda makes me want to find another SH. You are an extremely lucky man. No offense but I think it should be her on here saying her husband is riding a poser-hawk and trying to cling onto her hawks coolness. You can come to the cool kid meetings if she brings you. Otherwise its back to the A/V club. Well I've never heard it accused of that before haha. Honestly it was my only gripe when I first bought one way back when and I'm sure I'm not half the rider that a lot of guys on here are. Otherwise it's a sweeeet machine on the street. We need to see the other pics...... Haha. No seriously nice ride.... Oh the bike too. Wish my wife would ride. I have a z1000sx also. +1 for chicks on 'Hawks! My wife had an SV for a while. Fun little bike & a great beginner machine. Does your wife have previous experience? I bought an xr200 for her to learn on while me and my son rode dirtbikes. She liked it enough to go ahead and take the new rider course at the community college. Her first bike was an FZ6 but she wanted to sportier. She has about two years expierence now. An SV1000 a beginner machine? Did she have a 1k or a 650? I was referencing the 650, sorry 'bout that. C'MON MAN GET WITH THE PROGRAM! 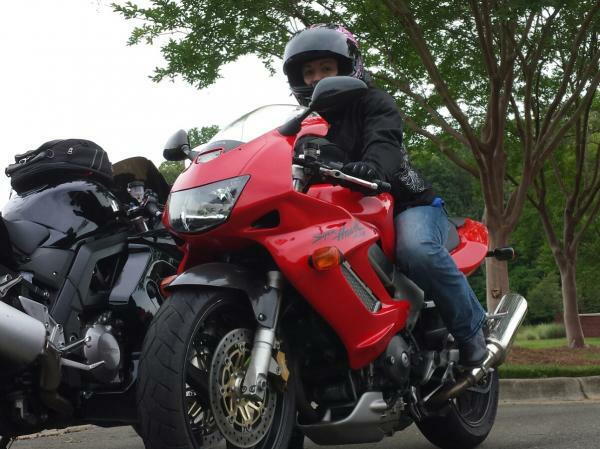 Seriously though I had an SV650 for a short time and was really impressed with the power. What a fun bike and sounded fantastic with a full M4 exhaust on it. A lazy seller of a TL1000S (asked him for the warrantly info and he promptly got back to me over a month later)and a glowing review in Cycle World is what originally brought me to the dealer and my first (and only) new vehicle purchase-a brand new leftover '98 Superhawk. I've brought 5 more of them home since lol. Last edited by captainchaos; 06-12-2014 at 02:42 PM. Beauty and Brains, she is Bona Fide! Beautiful bike and welcome to the family. Im very interested in thoughts on power difference. Ive got a mate with a SV1 that wants to line me up at the drags. I dont want to lose. maybe compressed? Front fairing Lowered in the triples? Anyway, its late. And it is nice having another female rider onboard. Wifey will love the superhawk. Your eyes are not deceiving you the bike is lowered. The previous owner did it and she likes it although we will likely bring it back up a little. Always good to see a lady on a bike, even better a red Hawk. Superhawk love her like your wife.